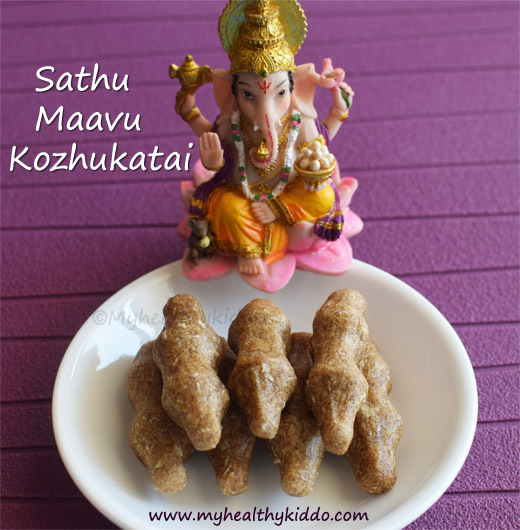 If your kid runs far for sathu maavu koozh(here), then try sathu maavu ladoo(here) or this sathu maavu kozhukattai. He/She might like anyone of these. 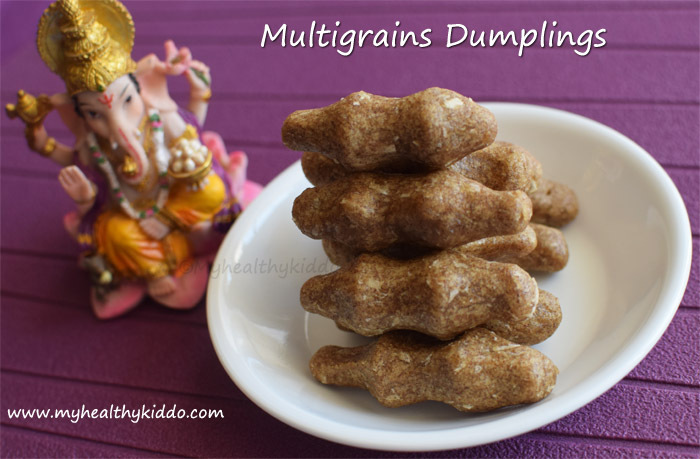 When a kid dislikes a food, don’t avoid it.. Just try variations to include it..
Sathu maavu/Multigrain powder(here) is an essential nutritious mix to be found in our pantry at all time. It gives immense nutrition to all ages. Enjoy any recipe of your choice, but do remember that one spoon sathu maavu a day, keeps your deficiencies away !! Take ¾ cup of sathu maavu/multigrains flour and ¼ cup of rice flour in a pan and fry in medium flame for 2 mins or until hot to touch. Transfer the flour to a mixing bowl and let it cool down. Add ½ cup of jaggery along with ⅓ cup of water and let it boil until jaggery dissolves in water. In a tsp of ghee, fry ⅓ cup of grated cocout just for a minute or so. Add ghee-fried coconut to the mixing bowl. By this time, jaggery would have completely dissolved in water. Do not thicken it. Switch off immediately so that the consistency of the syrup is as thin as water. Filter jaggery water to the mixing bowl and mix with a spoon. Once mixed well with spoon, use hands to mix again. Sprinkle more water if the dough is dry or stiff. Pinch out a ball from the dough. Press fingers against the palm to make shape. Repeat this 2-3 times to get good shape. Shape all dough to dumplings. Steam in idli maker for 15 mins. 1.Fry the flour in low-medium flame and keep stirring so that the flour is not burnt. 2.Tightly pack jaggery for good sweetness. Loosely pack for milder sweet. 3.I have not added cardamom powder as I have added cardamom while making sathu maavu/multigrains powder. Pls add if your flour don't have it in the ingredients. 4.If you want very soft dumplings, sprinkle more water to the dough. 5.If you made this in the morning and if you wish to serve in the evening, just steam for 3 mins before serving. 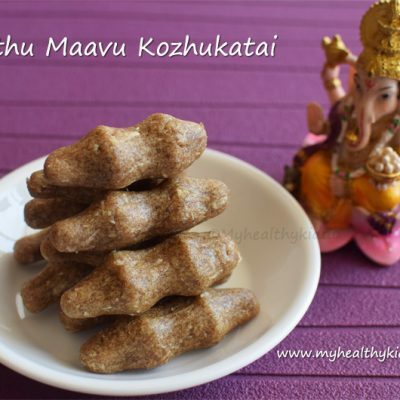 Preparation – How to make sathu maavu kozhukattai ? 1.Take 3/4 cup of sathu maavu/multigrains flour and 1/4 cup of rice flour in a pan and fry in medium flame for 2 mins or until hot to touch. 2.Transfer the flour to a mixing bowl and let it cool down. 3.Add 1/2 cup of jaggery along with 1/3 cup of water and let it boil until jaggery dissolves in water. 3.In a tsp of ghee, fry 1/3 cup of grated cocout just for a minute or so. 4.Add ghee-fried coconut to the mixing bowl. By this time, jaggery would have completely dissolved in water. Do not thicken it. Switch off immediately so that the consistency of the syrup is as thin as water. 5.Filter jaggery water to the mixing bowl and mix with a spoon. 6.Once mixed well with spoon, use hands to mix again. Sprinkle more water if the dough is dry or stiff. Pinch out a ball from the dough. 7.Press fingers against the palm to make shape. Repeat this 2-3 times to get good shape. Shape all dough to dumplings. 8.Steam in idli maker for 15 mins. 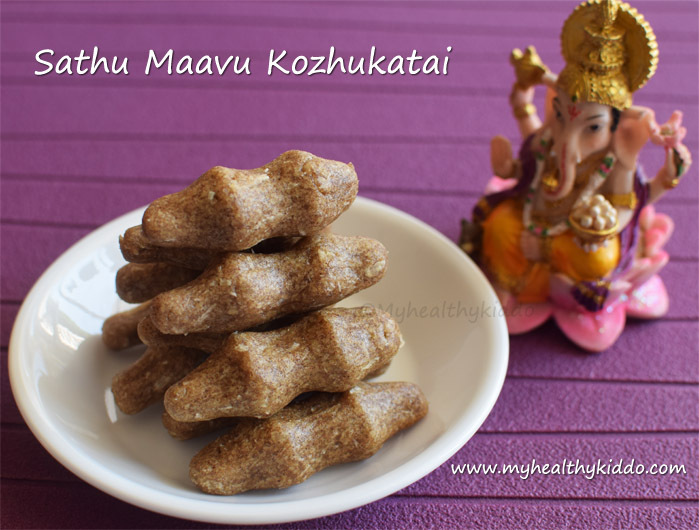 Healthy sathu maavu kozhukattai is ready in a jiffy.. Enjoy !! Fry the flour in low-medium flame and keep stirring so that the flour is not burnt. Tightly pack jaggery for good sweetness. Loosely pack for milder sweet. I have not added cardamom powder as I have added cardamom while making sathu maavu/multigrains powder. Pls add if your flour don’t have it in the ingredients. If you want very soft dumplings, sprinkle more water to the dough. If you made this in the morning and if you wish to serve in the evening, just steam for 3 mins before serving.